In one of projects which I'm involved in we had to configure the limit for concurrent requests being processed. The project is quite specific, processing of a request is quite heavy and requires considerable resources. 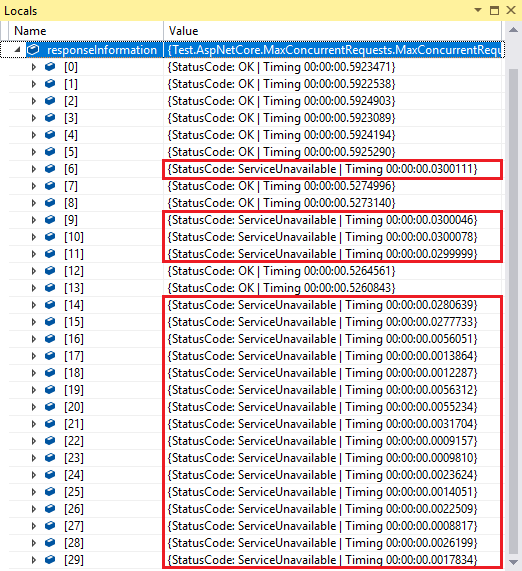 Because of that, when there was a high number of concurrent requests to process, the server was becoming unresponsive. I went on some research for best practices in this area. The "stress your server and see" seems to be the best advice but number of possible different approaches got me interested. In order to satisfy my curiosity I've decided to implement couple of them myself. Limiting concurrent requests is a server responsibility, there shouldn't be a need for application to handle it. This is one of reasons for suggestion from the ASP.NET Team to run Kestrel behind fully featured web server like IIS or nginx (some limits support has come in 2.0). Despite that here I'm implementing a middleware. This is not that bad, registering such middleware at the beginning of the pipeline should prevent heavy processing early enough. Still I'm doing this just for fun, don't do it in production unless you have an unquestionable reason to do so. For the testing purposes I've decided to set up couple integration tests using XUnit and Microsoft.AspNetCore.TestHost. The general setup is very well described in documentation. As I intended to spawn multiple requests I wanted to have some rough timings captured for them, so I've prepared following extension method. This is not perfect (the timings have risk of not being accurate) but should be good enough. I also wanted to have easy access to status code and timing during debugging so I've introduced another intermediate representation. I've also created a prepare SUT method for instantiating TestServer. With all those elements in place I've created a general method to be reused by all tests. This (by providing different configuration and concurrentRequestsCount) will allow me to test different approaches I'm going to play with. The first and most important thing which middleware needs to support is a hard limit. 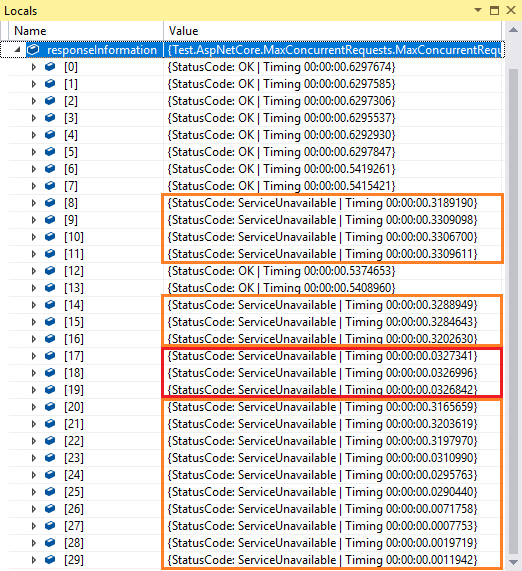 The functionality is very simple in theory, if the application is processing maximum number of concurrent request every incoming request should immediately result in 503 Service Unavailable. The challenge hides in maintaining the count of concurrent requests. It must be incremented and decremented in a thread safe way while affecting performance as little as possible. The Interlocked class with its atomic operations for shared variables seems perfect for the job. I've decided to use the Interlocked.CompareExchange "do-while pattern" for check and increment which should ensure that value will not be exceeded. After adding the middleware to the pipeline I've set up a test with 30 concurrent requests and 10 as MaxConcurrentRequestsOptions.Limit. The result is best observed through responseInformation temporary value. There are 10 requests which resulted in 200 OK and 20 requests which resulted in 503 Service Unavailable (red frames) - the desired effect. The hard limit approach gets the job done, but there are more flexible approaches. In general they are based on assumption that the application can cheaply store more requests in memory than it's currently processing and client can wait for the response a little bit longer. Additional requests can wait in queue (typically a FIFO one) for resources to be available. The queue should have a size limit, otherwise the application might end up processing only the queued requests with constantly growing latency. Because of the size limit requirement this can't be simply implemented with ConcurrentQueue, a custom (again thread safe) solution is needed. The middleware should also be able to await the queue. On a high level a class looking like the one below should provide the desired interface. 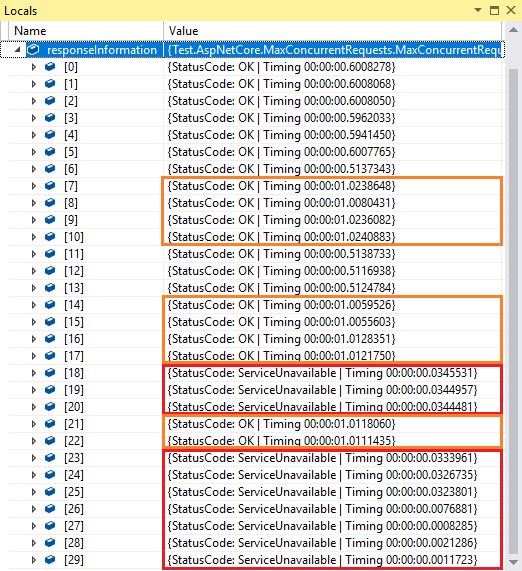 The EnqueueAsync returns a Task<bool> so middleware can await and use the Result as indicator if the request should be processed or not. Internally the class will maintain a Queue<TaskCompletionSource<bool>>. Yes this is locking, not perfect but the request which ends up here is going to wait anyway so it can be considered as acceptable. Some consolation can be the fact that this class can be nicely used from the middleware. Below is the result of another test. The number of concurrent request is again 30 and the max number of concurrent requests is 10. The queue size has been also set to 10. The requests which have waited in queue are the ones in orange. This approach is called drop tail and has an alternative in form of drop head. In case of drop head when a new requests arrives (and the queue is full) the first request in the queue is being dropped. This can often result in better latency for waiting requests at price of dropped requests having to wait as well. The MaxConcurrentRequestsEnqueuer can be easily modified to support drop head. My test scenario is not sophisticated enough (all requests are arriving roughly at the same time) to show the difference between drop tail and drop head, but this article has some nice comparison. There are two more things which would be "nice to have" for the queue. First is support for request aborting. Right now if the request gets cancelled by client it will still wait in queue taking spot which one of incoming requests could take. In order to implement the support for request aborting the internals of MaxConcurrentRequestsEnqueuer needs to be change in a way which enables removing specific request. To achieve that the Queue<TaskCompletionSource<bool>> can no longer be used, it will be replaced with LinkedList<TaskCompletionSource<bool>>. This allows enqueue and dequeue to remain a O(1) operations and adds possibility of O(n) removal. The O(n) is a pessimistic value, in reality the aborted request will be typically at the beginning of the list so it will be found quickly. Only a couple of changes to MaxConcurrentRequestsEnqueuer is needed. Now the support for CancellationToken (which will carry the information about request being aborted) can be added. The middleware can pass HttpContext.RequestAborted as the CancellationToken (it is also a good idea to wrapp the response status setting code in IsCancellationRequested check), which should ensure that all aborted requests will be removed from queue quickly. Second useful thing is limitation of time which request can spend in queue. This is just additional protection in cases when queue gets stuck and clients doesn't implement their own timeouts. As the cancellation is already supported this can be nicely introduced with help of CancellationTokenSource.CancelAfter and CancellationTokenSource.CreateLinkedTokenSource. The timeout can be clearly shown through test by setting max time in queue to value lower than processing time (for example 300ms). As expected there are two groups of dropped requests, the ones which were dropped immediately and ones which were dropped after max time in queue. This (quite long) post doesn't fully explore the subject. There are other approaches, for example based on LIFO queue. If this post got you interested in the subject I suggest further research. More "polished" version of MaxConcurrentRequestsEnqueuer and MaxConcurrentRequestsMiddleware with demo project and tests can be found on GitHub.